Last Tuesday we ran the fourth Google Firestarters of the year for the Performance Marketing community. 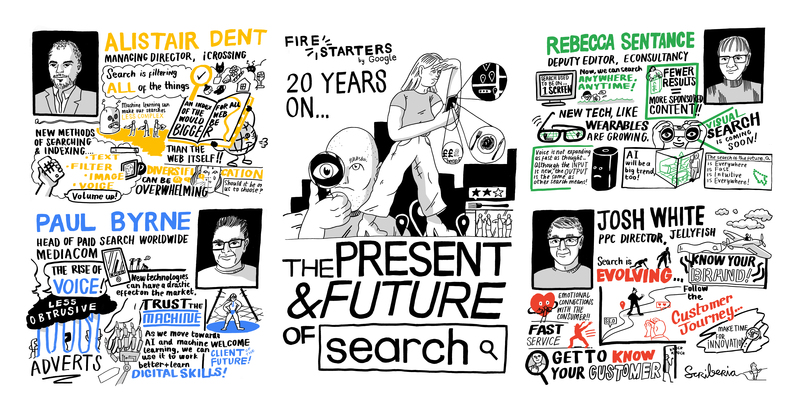 It being Google's twentieth anniversary we took as our theme the present and future of search, and challenged a great line-up of speakers to consider not only where search is now, but what the next twenty years might look like. Alistair Dent (Managing Director of iCrossing) went first. He began by talking about how the complexity around the core function of search (indexing and filtering) had grown to such an extent that the use of machine learning had become an inevitable way of making sense of the infinite number of connections and factors that can help us find the answers we are looking for out of trillions of elements. Instead of a complicated algorithm defining an infinite set of rules, we can plug in the machine and it adjusts and learns until it gets it right. If we're smart enough we can even make this predictive so that we get the answers before we've even searched for them. Search is diversifying across not only what it looks for (web pages, media, services, products), but also where it looks (web, personal data, apps, social networks) and how you input (text, image, voice, behavioural data). Yet as digital content proliferates we are seeing an increasingly diverse set of platforms and walled gardens - apps, social networks, messaging services - which make it increasingly difficult for search to effectively span the full range of content and assets available. Alistair's provocation was that we will eventually see a situation where the system is flipped and instead of search being a destination where we ask questions and seek answers, it will develop into a distributed system where we each have our own personal search systems which will interface with many content indexes and walled gardens in order to get the answers we need. Search will be fundamentally different in how it operates, but will also feel familiar. It was a truly challenging and forward-thinking concept to kick us off. Paul Byrne, Head of Paid Search Worldwide at MediaCom, took a different angle on what is important for us to consider for the future. As search becomes more predictive and inputs change, marketers will need to spend more time using automation to market effectively to machines and make sure their brand solutions are included in the answers that people are seeking. With internet of things and smart homes, every device and appliance has the potential to become a channel and the increasing ubiquity of search will push the need for even greater automation. Rather than ignore or be fearful of this kind of change, said Paul, we need to embrace it as inevitable. Increasing automation will allow us to move on from executional and repetitive work to allow more time to be spent on the strategic use of data signals to deliver a client objective. In response specialisms are likely to gain breadth to become more multi-channel, new skills will focus on how best to leverage automation, and it will allow more time for the application of skills like data science. Paul talked about how this will mean that leaders will need to break open their networks to find people that are different to them, and make sure that they are bringing their teams on the journey with them, helping them to navigate change and uncertainty. Clients too will need to upskill in data and performance, which could result in a talent migration from agencies to clients. And they will need to break down silos. Agencies will need to adapt faster to engage staff on their own journey (he used data from The Shipping Forecast talent survey which showed that 39% of respondents had thought about leaving the industry in the past year and another 54% were thinking about moving company). Agencies need to see automation as value rather than cost-saving, be nimble and transparent, and create the marketing roles of the future. It was an upbeat, positive assessment of the future. Rebecca Sentance from Econsultancy writes a lot about the future of search, and took a broad ranging but truly insightful look at how search is really likely to change over the near to mid-term future, and along the way debunking some of the more well-shared but often relatively unfounded predictions that do the rounds. She talked about the heightened complexity of customer journeys and search and the likely realities behind some key over-arching trends including voice, visual search, and augmented reality. The Gartner prediction that by 2020 30% of browsing sessions will be carried out without a screen, she said, is highly unlikely given that what we're currently seeing is more interaction via screens than ever. Similarly the oft repeated prediction that by 2020 50% of searches will be voice needs a reality check. Voice search in its current form is unlikely to become widespread, but voice inputs do have the potential to become huge as this form of interaction becomes embedded in everything from cars to appliances. Perhaps the real challenge for voice search is that it needs some kind of onward journey from the original search query. Things like schema markup have been introduced to improve the way in which search engines can present results and enable more intuitive, smart next steps and this kind of approach could be used to provide logical and next best actions in search. Google is already using this kind of approach for example to carry out a beta with news publishers where news results are read aloud. For performance marketing in this environment, we can guess that voice search may well result in fewer results and even more prominence to those at the top of the list. Having paid ads as part of that list could reduce user trust and potentially allow for less useful results. But paid ads might follow on as suggestions after organic results, giving users the option of a logical next step to action a search. In this scenario, consent would be key, perhaps leading to cost-per-consent models and keyword-based bidding with more specific queries which are perhaps more dependent on context. Similarly, whilst visual search (which uses the world around us to search for information online, and so not to be confused with image search) is still in its infancy, it has huge potential to develop as technology like AR advances. Rebecca talked here about the enhanced role that inspiration will play in driving visual search (for example being able to easily search and buy a pair of shoes you see someone wearing using your phone's camera). Some e-commerce sites (like ASOS, who have said that they expect sales to grow 30-35% with visual search) are already developing visual search capability. The potential here is for more recommendation-based advertising which if done well could be useful to the user. Search in the future will be fast, intuitive, convenient, flexible, everywhere. But in order to make sense of the commercial opportunity we need to rethink our approach to formats. Rebecca's talk was truly fascinating. Last up Josh White, PPC Director at Jellyfish, also focused on the growing power and ubiquity of automation. He talked about 'automation creep' across an increasing number of capabilities from buying, to reporting, creative, optimisation and attribution. Building on some of the themes that Paul had talked earlier he described how the opportunity for performance marketers in the future will be to take a clients business strategy and work back to identify which data signals will be key to developing a solution. These data signals may vary widely according to the specific business objective (taking performance into less familiar top-of-funnel areas perhaps) but will require an in depth understanding of the brand, and new skills to capitalise on the potential that greater use of contextual data will bring. Again, this was an interesting thought about not only how search will change, but the practice of performance marketing. The talks gave four very different perspectives but were all characterised by a healthy dose of optimism about the future of the performance marketing industry. Its clear that search will change perhaps beyond all recognition over the medium-term future, but we can start thinking now about how we can position our capability to be ready for this change. As always my thanks to our speakers for four excellent and provocative talks, to Google for hosting, and to all those that came along and joined in the debate. And my thanks also to the clever folk at Scriberia who again did such a fantastic job at visualising the debate (you can see the visualisation in all its glory here). As we move into planning for 2019, Firestarters continues to be an ongoing discussion into the key areas of challenge and opportunity in our industry and so I'm very happy to receive suggestions for topics that you'd like us to cover.